You can now invest in pre-vetted real estate projects from the comfort of your home in $5,000 increments. Our experienced team thoroughly diligences each loan. Less than 8% of applicants are approved for funding. We invest alongside you to make sure incentives remain aligned. Up your investing game by discovering how macrotrends in the industry can affect your profit from real estate investments. 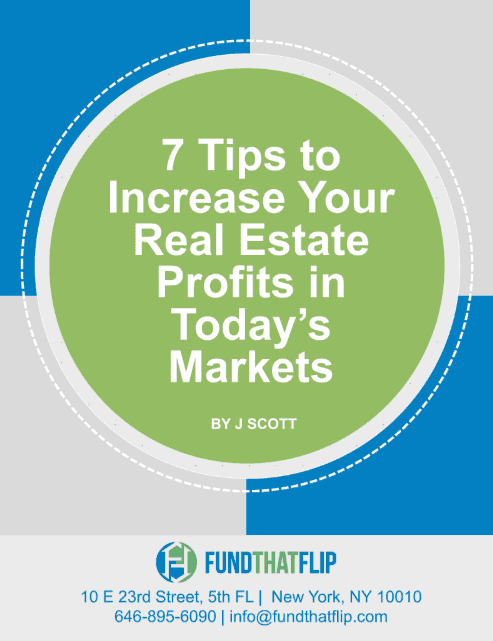 Read our free white paper from rehab guru J Scott to see how you can make more money on your investment properties through better knowledge of the market’s cycles, risks and trends. To-date, we’ve paid investors millions in interest payments and returned principal, all with $0 losses. On average, investors have earned an annualized return over 10.75% with principal repayment in under 10 months. Only 6-8% of all projects submitted on Fund That Flip meet our underwriting criteria. Each project is managed by a team that has completed at least 4 projects in the last 12 months. Funds are distributed so that the borrower always has meaningful equity in the project - ensuring incentives are always aligned. You can invest in $5,000 increments creating the ability to diversify across maturity dates, geographies and yield. You have the power to build your own portfolio of high-yield residential real estate loans. Pick the projects that fit your risk/return profile best and then sit back and collect interest each month. Your investment corresponds to an underlying first-position mortgage. In the event the project doesn't go as planned, your downside will be protected by the value of the real property. Your investment is further insulated by the borrower's 15-20% equity. What do I need to do to invest on Fund That Flip's Platform? Step 1: Create an account and complete your profile as an accredited investor. Step 2: Read the Private Placement Memorandum and associated sample investor documents. Step 3: Review and diligence the current projects open for funding. Step 4: Start investing with project minimums of only $5,000! Why do I have to be an Accredited Investor to invest on Fund That Flip's platform? The investments on Fund That Flip are private placements that are made pursuant to SEC rule 506(c) of Regulation D. In order to qualify for certain filing exceptions, the SEC allows only Accredited Investors to participate in these types of offerings. What will I "own" when I invest in a project on Fund That Flip? When you invest in a project on Fund That Flip you are investing in a Borrower Dependent Note (BDN). The performance of the BDN correlates directly with the performance of a note that Fund That Flip invests in with the redeveloper of the project you've chosen. The underlying note is typically a first-position mortgage or similar security. While the note that you purchase is unsecured, the terms of your note gives you rights to the proceeds generated from the underlying note that is securing the real estate — hence the name 'Borrower Dependent'. While BDNs are technically unsecured debt instruments, each debt offering is secured by a first position lien on the underlying property (the collateral). The reason that BDNs are not technically secured is that the collateral is not pledged directly to the holder of the BDN but, rather, is pledged to the Indenture Trustee under which the investor benefit as BDN holders. Here's what our investors are saying.